Vanarama-sponsored Hemel Storm launched their bid for a National League Division One Play-Offs spot beating Newcastle at home 85 - 79 on Saturday and then in a major upset defeating the League’s second placed Worthing Thunder 114 – 109 in a double overtime thriller the next day on the south coast. And in a consummate and gutsy team performance Hemel’s dynamic guard Bode Adeluola produced an incredible individual performance playing the full 50 minutes of the contest and leading his side with 41 points, scoring 15 from19 attempts and 9 from 11 from the free-throw line, along with 11 rebounds, two assists and two steals. Basketball England has awarded Adeluola ‘NBL Player of the Week’ for his virtuoso performance. Hemel’s new 6’ 7” American signing TrayVonn Wright made an impressive home debut on Saturday with 20 points, 11 rebounds, two assists and two blocks for his new team and added 14 points and eight boards against Worthing before fouling out with six minutes of the first overtime period left after a series of disputed calls. The two victories move Storm out of the relegation zone and into twelfth place in the table with a 5 wins, 9 losses record as they battle to win a place in the prestigious top-eight National Championship Play-Offs. 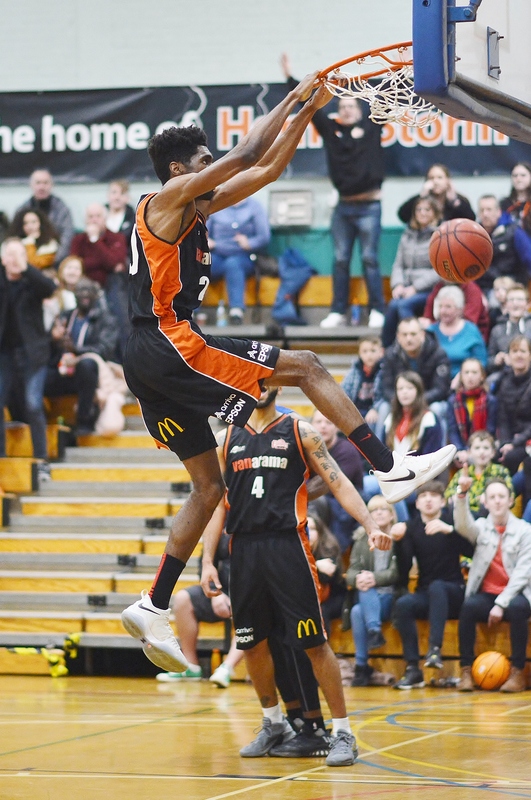 On Saturday Storm built a 21 point lead (73 – 52) in the opening minutes of the fourth quarter but Newcastle responded with a flurry of three-pointers to close to just 81 – 77 before a pair of Leome Francis free-throws and a massive Wright dunk sealed a crucial victory to the relief of the packed crowd. Hemel trailed early on but put together a strong third quarter performance to give themselves the breathing room needed to pick up an important win against a fellow bottom three side. The visitors started the brighter and pulled away for an early 10 point advantage midway through the first quarter. A solid end to the period saw Hemel regain their composure and tie things up throughout the second and then take a five point lead into the locker room at half-time. On Sunday Storm took control of the game early against Thunder as they edged ahead and held their narrow advantage for much of the first 25 minutes of the game before Worthing came storming back to regain the lead heading into the final stanza in regulation time. In a nail-biting clash where the lead changed hands 21 times and the teams were tied-up 15 times, Worthing may have thought they'd grabbed the win as they led much of the fourth period before former BBL MVP Zaire Taylor gave them an 85-81 lead with three minutes to play. Wright quickly responded for Storm with a three-pointer and two minutes later it was Wright again who would tie things up at 88-88. An Adeluola lay-in gave Hemel a 88-90 lead with 35 seconds left but Jorge Ebanks responded and tied the game with 22 seconds to play before Adeluola's game-winning triple attempt bounced off the ring. 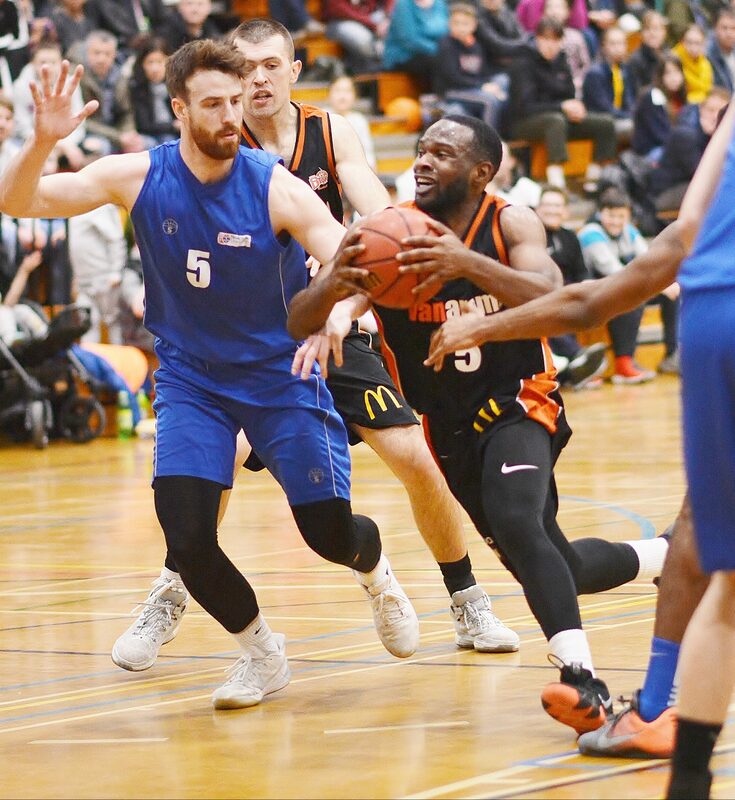 In a competitive overtime period Thunder’s Ebanks looked to be the hero again when he went two-from-two at the foul line to give Worthing a 98-97 advantage. Blayne Freckleton responded with a huge triple to give Hemel the 98-100 lead, before Thunder captain Brendan Okoronkwo tied the game at 100-100 with a lay-up. Foul trouble was the story of the second overtime period, with both teams in the penalty it was time to take advantage at the free throw line. Hemel went 10-12 from the stripe in the final five minutes, a crucial contribution to their final tally as they made the foul shots they needed down the stretch to pull away and record an impressive victory. For Storm, as well as Adeluola’s and Wright’s contributions Blayne Freckleton added 18 points and seven rebounds, while Leome Francis finished with a double-double of 17 points and 11 rebounds. while Levi Noel recorded 13 points, eight rebounds and four assists. Adeluola 41, Freckleton 18, Francis 17, Wright 14, Noel 13, Ashby 9, Henry 2, Burnell, Adorian, Hayes, Lewis. Storm’s next home game is on Saturday 16th February, tip-off 7.00pm, at Hemel Leisure Centre against Essex Leopards. Hemel Storm’s second team returned to winning ways with a hard-fought 4 point win over Anglia Ruskin University at JFK School on Sunday. Storm were keen to make amends for the loss in the reverse fixture just 3 weeks ago but it was ARU who took the early initiative as they opened up a 5 point margin mid-way through the first quarter. But Hemel responded immediately. Centre, Mike Coumas, bullied his way to the basket to convert a driving layup and in the next play point guard, Nick Allin, picked out Coumas again with an audacious behind-the-back assist to cut the deficit to just one point at the end of the quarter. The home team dominated a low-scoring second quarter their miserly defence giving up only 11 points. Veteran guard Simon ‘Spud’ Kearney - making only his fourth appearance of the season - was instrumental in driving the team to a 31-27 half-time lead with tenacious defence and composed offence. Storm held firm in the second half never relinquishing the lead. An outstanding contribution in the fourth quarter from forward Craig Percival helped to extend the lead to ten points. Things got a little uncomfortable for Hemel as a flurry of points from the visitors cut the lead back to two with just a minute remaining. A triple from Nick Allin relieved the pressure and the win was cemented as Percival was successful with two free throws. Storm II’s last home game of the 2018/19 season is on Sunday 17th February, tip-off 5.00pm, at JFK School against Southwark Pride.